Brass Cleaning: Wet, Dry or Both? If you reload, you know you have to use clean brass. But if you will be reloading brass that’s been fired recently, it will be coated with soot. Soot is carbon and carbon is hard. You need to clean it before reloading. There are two general processes to cleaning brass, the wet and the dry methods. Which is best? That’s where it gets interesting because each has advantages and disadvantages. Each method has different steps, takes a different amount of time, requires more or less of your time, and gives slightly different final results. In this article, we will look at each process, mention some of the critical aspects to be considered, and then conclude with a process that combines a little of each and gives excellent results for a minimum of effort. Separate the brass from the media. The big advantage to the dry process is time, your time. You load the brass into a vibratory cleaner, turn it on but then you are free to do something else. Hours later you come back, spend a few minutes separating the brass from the cleaning media and you’re done. Total “user” time is no more than a few minutes. But it makes dust, rock-hard dust. While most vibratory cleaning machines have a tight sealing lid to stop dust from getting out of the machine, each piece of brass that comes out will still have a light coat of dust made from soot and cleaning media fragments. This dust is small enough to cause problems in the reloading machine where tolerances to a thousandth of an inch are required, and it is hard enough, if captured between two faces, to gouge the brass or even scratch hardened steel. This is very bad for the reloading equipment. Getting rid of that dust brings us to the wet process. Basically you wash, rinse and dry the brass but with a couple of small additions. First, and here’s where opinion and practice differ, some reloaders insist on depriming the brass before beginning the process. This is done, they say, for two reasons. First, with the old primer removed, the primer pocket itself can be cleaned. And second, with the primer removed, there’s no place to trap water for an extended period. Reloading brass that still has water lurking about can be disastrous. It can result in what is called a “squib” which leaves a bullet lodged in the barrel and, if the shooter fires again, the barrel will split under the enormous pressure and spray shrapnel in the immediate area. This can be life threatening. Water in the brass when reloading is bad, very bad. 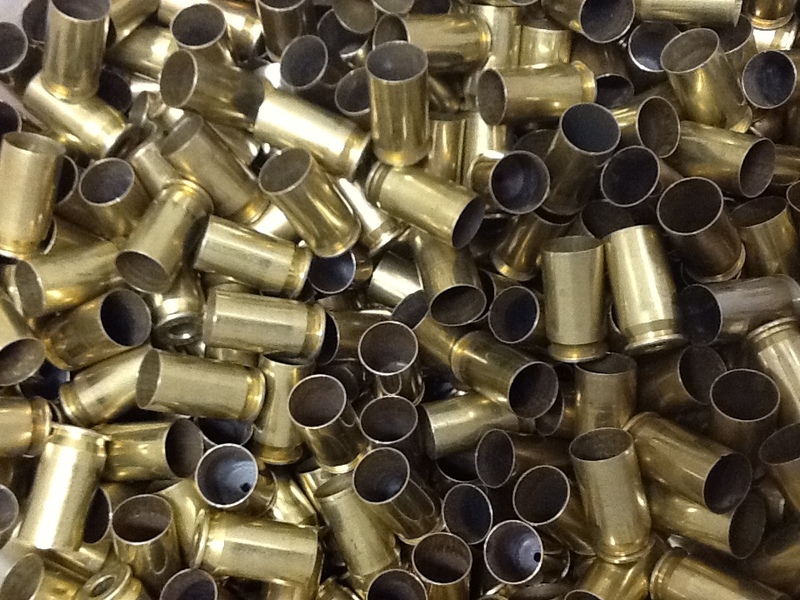 So, many reloaders insist the brass must be deprimed before starting the wet cleaning method. But since both actions are done at the same time, and because the fired brass still has a coating of soot and debris since it hasn’t been cleaned yet, this method cannot be used on dirty brass. The dry carbon on the dirty brass would score or scribe into the brass, weakening it. A die that simultaneously deprimes and resizes should not be used with dirty brass. It will damage the brass (and the die). The second way of depriming brass is with a dedicated depriming tool. These are either manual requiring each piece of brass to be handled separately, or are available as a special die for the reloading press which, if it is a progressive with a brass feeder, can go quicker. Regardless, depriming before cleaning is an additional step, and it takes time, your time. As I looked into the alternatives, I would pay more and more attention to how much of my time would be required. Less would be better. In the wet process, many reloaders use a Thumler’s Model B rotary tumbler or similar model. In the Model B, they report they can process about 250-300 pieces of 45 ACP, about two pounds, in each batch. They place brass and water into the tumbler, add cleaning media such as stainless steel pins or porcelain beads – some use no cleaning media – and, just before sealing and starting, they add a teaspoonful of liquid dish-washing detergent such as Dove, and a quarter to a half teaspoon of Lemi Shine powder, available from Walmart. The mixture is then sealed inside the tumbler container and the machine turned on. The media must then be rinsed of all soap and additives. Opinion varies on whether hot water is better than cold. You’ll just have to decide that one for yourself. After rinsing, if cleaning media was used, it must be now separated from the brass. The only practical way of doing this is with a media separator. There are many available on the market and, in my experience, they all work about the same for up to a couple of hundred pieces of brass. For the dry process, separation is very fast and only requires a minute or so for 100% separation. But with the wet process extra handling may be needed as the water tends to make media and brass stick. It doesn’t separate as easily as the dry. And media that sneaks past this step and stays inside a shell will be a problem when reloading. A second rinse, this time while in the media separator, may be helpful. Specifically, you should turn the media separator to agitate the brass and, at the same ime, spray it with clean water. This gives any last cleaning media pins or beads a second chance to be washed away (into the separator’s catch pan or bucket. With wet cleaning, drying is next and, as we’ve already noted, it must be 100% effective. Any remaining moisture could damage subsequently reloaded rounds and possibly result in a catastrophe at the range. So, to make sure drying is complete, there are some possibilities. For one, the drying could be accelerated by elevating the temperature such as by using the family oven set to a low temperature, 200 degrees for example, with the brass spread on a used-for-nothing-else cookie sheet and left to bake for an hour. Others have suggested spreading out the brass and using a small heater to speed up the process. But if the heat is unevenly applied, or if the temperature is raised too high, the elastic properties of the brass might be compromised. We want to dry the brass, not ruin it. In my limited survey of reloaders, I found that the majority of those following the wet process simply used nothing more than the ambient temperature in their garage or a spare room, and that they universally allowed it to take place over several days. The brass was spread out on old towels and, other than an occasional stirring, simply left to sit for several days. In talking with many reloaders, I found that while the depriming step seemed to be of critical concern for rifle ammunition, this was not so with handgun ammunition reloaders. Indeed, as long as sufficient time was allowed for the brass — and primer pocket — to completely dry, some handgun ammunition-only reloaders skipped the labor intensive depriming step. They washed and dried the brass with primers intact. And one reloader used no cleaning media and only a small amount of agitation in his wet process. Just water, soap and a liquid additive in a Lortone rock tumbler, a QT 66, if I’m not mistaken. This simplification obviated the “media separation” step so that his wet process became three steps. And since the last step, “Dry the brass”, requires little more than spreading out the brass and leaving it, his shortened process was just about as straight-forward and needing little more time than the dry process. The advantage of the wet process, again, is dust control. In the wet process, the “dust” is captured and carried away with the water. It does not coat the brass, get into the reloading machine, and it doesn’t scratch hardened steel parts. Instead, it is flushed away with the water. After taking a thorough look at both processes, it seems there is a way to retain simplicity while also removing most of the dust, and that is by simply rinsing the brass after using the dry method. In this combined process, user involvement is minimal. Rinsing and drying are new but only the first requires your time. So, the total personal involvement is only slightly more than with the dry process, and certainly much less than is required in the full-on wet process. And it’s might be worth speculating that the drying time might be shorter because the brass is never fully submerged in the added rinse cycle. The primer pockets might even remain dry. I intend to use this combined process from now on. Since I’ve been using the dry method or years, I already have all the equipment. All that’s added will be the backyard hose and a space for drying. So this past weekend, I cleaned the reloading room paying particular attention to where dusty brass had been. I have the shell feeder on my Dillon 650 and it was, in a word, filthy. I basically had to disassemble and clean every inch that the brass had been following, and leaving behind a coating of dust, through the whole machine. I also took my supply of “clean” brass and gave it a rinse as described above along with the buckets in which I store it. While the reloading room would not measure up to surgical clean room standards – no bunny suit will be required – it is far less dusty then before. And following the combined procedure, the reloading room and the reloaded ammunition should stay much cleaner from now on. Equipment will last longer and reloading will be more repeatable than ever before. Hitting the X once can be luck. Hitting it repeatedly takes precision. This entry was posted in Bullseye by Ed Skinner. Bookmark the permalink. Stainless steel media, John? If so, have you tried a batch without them? I’m getting mixed reports on them – and I’m worried about losing one down the garbage disposer which can’t be good for the disposer.